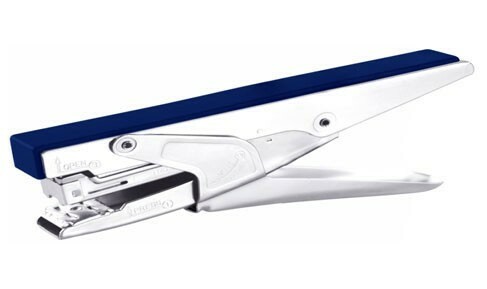 Dual stapler for use with No.10,24/6 & 26/6 staples. Rotating anvil for different staple type. INDICATES PINNING FEATURE IN THE STAPLER FOR TEMPORARY STAPLING. STAPLE CAN BE REMOVED EASILY. One strip having No.10 or 100 staples of 26/6 or 50 staples of 24/6 can be loaded at once. Indicate maximum insertion paper depth. The base length of depth is 175mm and breadth is 45mm. Upto 20_30 sheets (64 gsm) Can be perforated at once.